New collection skims the cream of Caffè Lena’s rich musical history | Will You Miss Me When I'm Gone? I should have known I was missing out. And now the Tompkins Square record label has shoved into my face some very real evidence of exactly how much I’ve missed. While The Turning Point, which has featured many of the same artists as Caffè Lena, doesn’t record shows as far as I know, its Saratoga Springs cousin, which was founded in 1960, apparently took great pains to document its programs. Live At Caffè Lena: Music From America’s Legendary Coffeehouse, 1967-2013 is scheduled for release Sept. 24. But I’ve had the pleasure of listening to a copy for a few weeks now. It’s a 47-track collection of pure delight for anybody who loves the music that came of age in America’s coffeehouses in the early 1960s and has continued to grow ever since. While the audio quality varies with the age of the track — there’s a bit of fuzz on the earliest recordings, while more recent performances are crystal clear — every track is full of heart and soul. 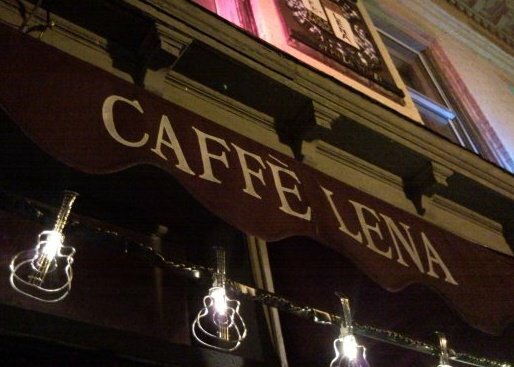 Tompkins Square (a San Francisco-based label despite its New York City-sounding name) has harvested great tracks from the Caffè Lena archives. The collection includes the dearly departed — like a rollicking Dave Van Ronk, Bill Morrissey, Kate McGarrigle and even Lena Spencer herself — much-loved survivors — Pete Seeger, Paul Geremia, Tom Chapin — and even some newer artists — Sarah Lee Guthrie and Johnny Irion, Mary Gauthier, Sean Rowe and Tift Merritt. Sadly, but not surprisingly, there’s no trace on this collection of one of Caffè Lena’s best-known alumni, Bob Dylan. Caffè Lena: Inside America’s Legendary Folk Music Coffeehouse (powerHouse Books) brings more than 200 never before seen, evocative images and stories to the public. Early 1960s photographs of Bob Dylan and Pete Seeger and modern-day images of Rufus Wainwright and Patty Larkin blend with rare memorabilia and an oral history derived from more than 100 original interviews of artists who have graced Caffè Lena’s stage over the decades, including Ani DiFranco, Utah Phillips, Dave Van Ronk, Spalding Gray, and other luminaries of the folk, blues, jazz, and theater worlds. 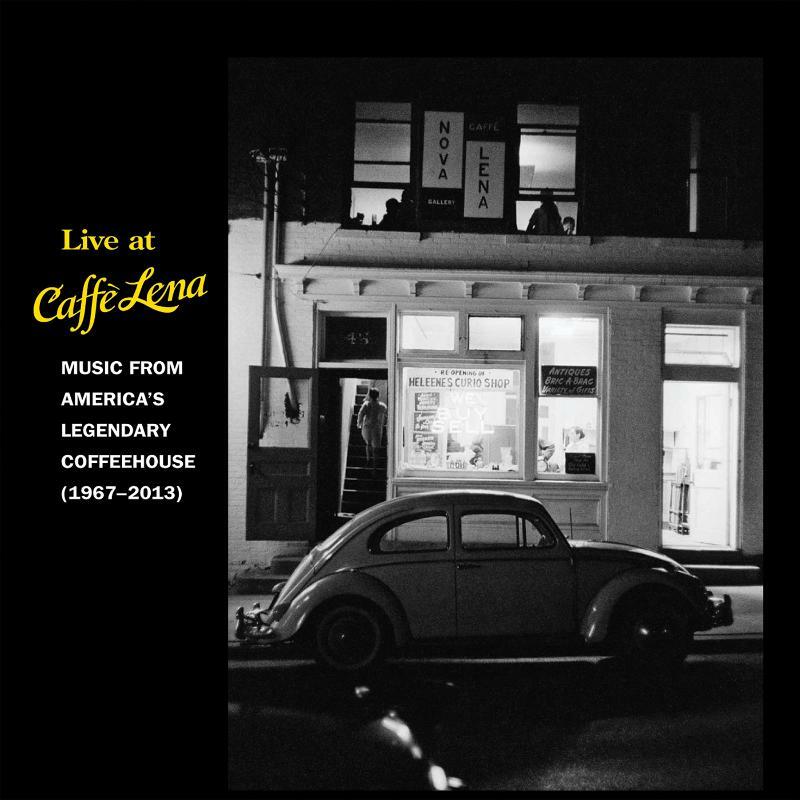 Live At Caffè Lena: Music From America’s Legendary Coffeehouse, 1967-2013, a 3-CD set, is available to preorder at Amazon.com for $34. It will also be available direct from Tompkins Square and most music retailers. This entry was posted in Blues, Concerts, Country, Folk, Jazz, mp3, Music, News, Recordings, Review and tagged Anais Mitchell, Arlo Guthrie, Artie Traum, Aztec Two Step, Barbara Dane, Beacon, Bill Morrissey, Bill Spencer, Bill Staines, Billy Faier, Bob Dylan, Bucky and John Pizzarelli, Bucky Pizzarelli, Caffè Lena, Chris Smither, Christine Lavin, Dave Van Ronk, David Amram, David Bromberg, Devonsquare, Frank Wakefield, Greenbriar Boys, Greg Brown, Guy Carawan, Happy and Artie Traum, Happy Traum, Hedy West, Jacqui and Bridie, Jean Ritchie, Jerry Jeff Walker, John Gorka, John Herald, John Pizzarelli, Johnny Irion, Kate McGarrible, Lena Spencer, Linda Williams, Mary Gauthier, Michael Cooney, Mike Seeger, Patrick Sky, Patty Larkin, Paul Geremia, Pawling, Pete Seeger, Phila Street, Piermont, Ramblin' Jack Elliott, Rick Danko, Robin and linda Williams, Robin Williams, Roma Baran, Rory Block, Rosalie Sorrels, Roy Book Binder, San Francisco, Sarah Lee Guthrie, Saratoga Springs, Sean Rowe, Sleepy John Estes, Smoke Dwason, The Towne Crier, The Turning Point, Tift Merritt, Tom Chapin, Tom Paxton, Tompkins Square records, Utah Phillips, Walking on Ice. Bookmark the permalink.